Yucatan Rosewood is a hard, warm golden brown wood with darker-reddish brown grain and pale sapwood. 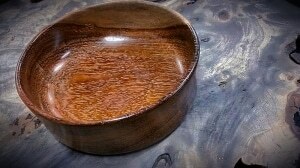 It looks like a cross between Honduras Rosewood and Cocobolo, but does not have the allergenic properties of either of them. It polishes to a glass like shine as you can see in this dice bowl we turned from Yucatan Rosewood. As you probably already guessed this wood is native to the Yucatan Peninsula.